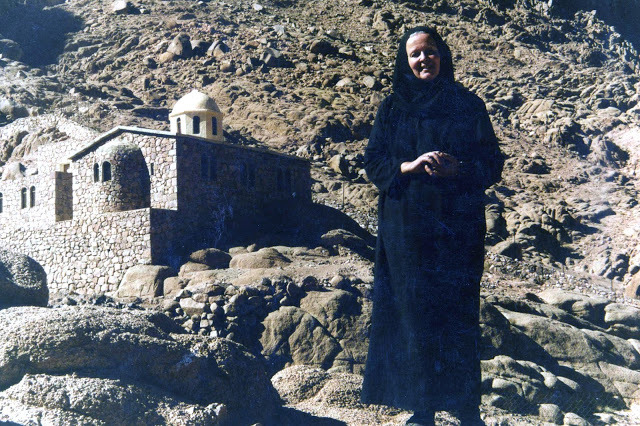 For the first six months at Sinai, Mary Magdalene slept outside among the boulders and rocks, having only a sleeping bag, with scorpions and poisonous snakes as her only companions. Many considered her to be a crazy and delusional woman. She had sold her home in Paris and bought a piece of land from a Bedouin just below the cave of St. John Climacus. There was already a carob tree and a well. She built five cells, a small chapel on top of rock, planted olive trees and a few apple trees, a vine, a garden, and built a small cistern. She also built a wall all around it. In this place Mary Magdalene lived a simple life, tending to her garden, making prayer ropes, and later in life she occupied herself with woodcarving which she used to decorate her chapel with icons. Initially she would go to the monastery every Sunday, but later on she would go every fifteen and on great feast days in order to receive Holy Communion. Some fathers from the Monastery of Saint Katherine took pity on her and protected her, but many rejected her and made her life difficult. Once they forbade Fr. Pavlos to accept her confession and did not allow her free hospitality at the hostel for women. She had strong faith and recalled the blessing the she had received from Elder Sophrony, St. Porphyrios and Matushka Lubuska the Fool for Christ of St. Petersburg to be there. It seems that those fathers who did not like her thought that she should not live alone in the desert, and should have stayed at the female monastery in Faran, where she should first have lived at least for a year and a half in obedience. 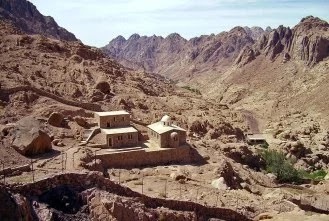 However, St. Paisios the Athonite, on his last visit to Sinai, when he visited the monastery in Faran, gave the nun Mary Magdalene his blessing to live in the desert after examining her and blessing her rule of prayer. She would go to Jerusalem every Holy Week and Bright Week, then return to her cell at Sinai. 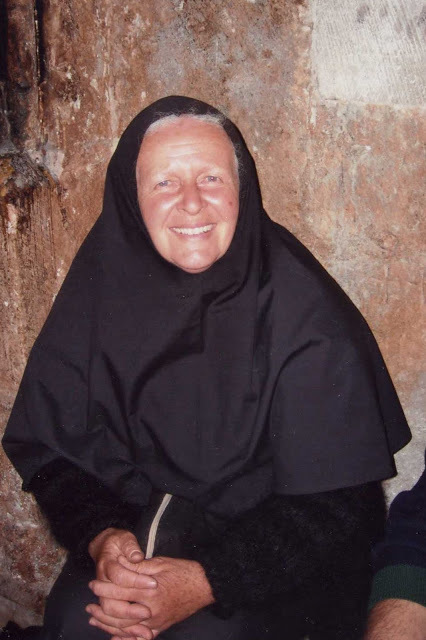 After the Pascha of 2009, she no longer went to Jerusalem. On the 18th of November in 2012, a Sunday, she went to Crete to be examined at the Venizelio Hospital, and was diagnosed with advanced bowel cancer. From there she went to Moscow where she knew the Bishop who oversaw the hospital of the Russian Church. There they did prolonged medical examinations and asked her to undergo surgery and chemotherapy at the largest medical center against cancer in Russia. But she did not accept, desiring to die at her beloved skete. She went to Saint Seraphim of Sarov's Hermitage, washed herself in his spring, and took great courage. She returned to Sinai via Italy, where she visited the Church of Saint Nicholas in Bari, and there she met a Russian woman named Euphrosyne, whom she asked to attend to her at Sinai. Euphrosyne responded positively and accompanied her to Sinai, where she attended to the eldress till the end, without any material benefit. Euphrosyne was a gift of God because she spoke only Russian, which Mary barely spoke and understood. But they had excellent co-operation and was a good caretaker to her (for about ten months), winning over the love and the respect of the fathers. After Pascha of 2013 Mary could barely move anymore, let alone go to the monastery, but she bore the cross of her painful disease with great courage and patience, without medical assistance and hospital care. On the 12th of December in 2013, a Thursday, at 1:00 PM, Eldress Mary reposed in the Lord in her cell., next to the cave of St. John Climacus. Fr. 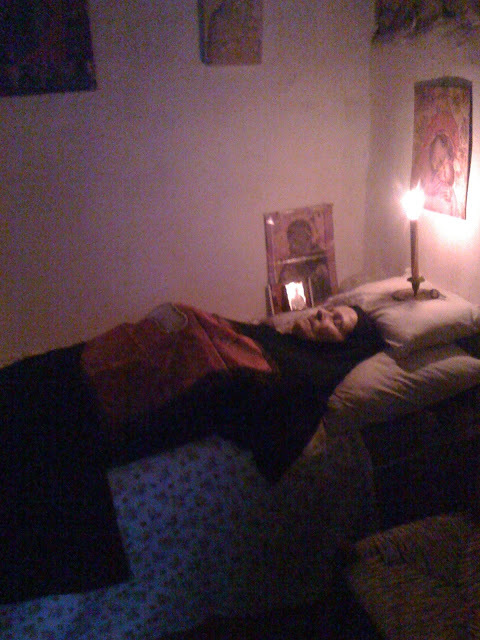 Pavlos of Sinai rushed to her and had served a Divine Liturgy in her skete to commune her before her blessed repose. The next day, after Fr. Pavlos served another Divine Liturgy, they had her body brought to the local hospital to confirm her death. There she was kept frozen until the issue of a burial permit from the French Consulate. Then a strange thing occurred that brought admiration from those there. 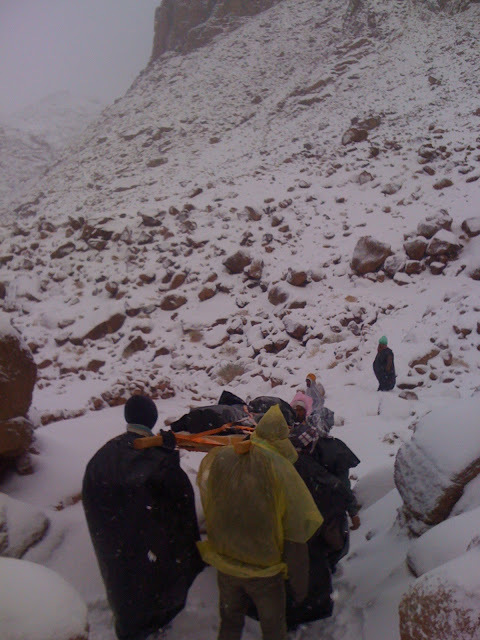 A snowstorm took place covering the area in white snow. The monastery therefore sent fourteen workers, all Christian Copts, to carry her body along the rugged terrain in the middle of a blizzard to her skete. Although it would take two hours to reach her skete from the motorway (which under normal conditions would take an hour), when they raised up her sacred relic it took them just 45 minutes to go the same distance, and a snowflake never even touched them. When her body had been placed in the car, a few minutes later the snowstorm began again. The permission to bury her was given on the night of December 17, 2013. 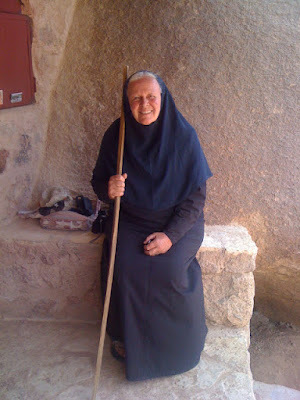 She was buried the next day, a Wednesday, at the cemetery of the female Monastery of the Prophet Moses in Faran according to the wishes of the fathers of the Monastery of Saint Katherine, even though it was her wish to be buried at her skete. No one who was near and dear to her attended her burial except Euphrosyne, who had served her with great self-denial. A German obstetrician who was known to her changed her garments for the burial, and stayed up all night beforehand to read the Psalter over her body, but she had left for Jerusalem before the funeral. 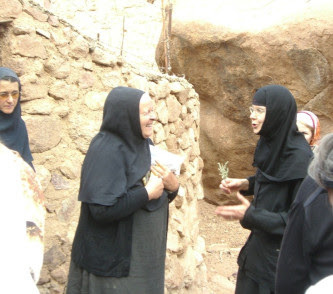 Archbishop Damianos of Sinai and the Hieromonks Michael and Eugenios did the funeral, with four nuns of the monastery in Faran.